snip>>> Originally published in Creation 7, no 4 (June 1985): 24. 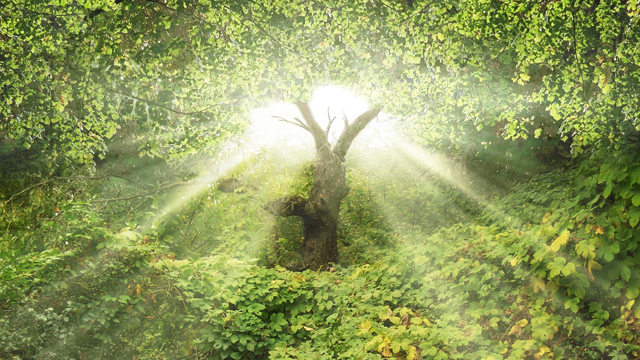 The Tree of Life stood in the centre of the Garden of Eden which elsewhere is called ‘The Garden of the LORD’.1 It was a real tree, to be sure, but let me suggest that it was also symbolic of the fact that God was, and is, the source of eternal life and blessing. Adam and Eve were to have their life centred in Him, even as the Tree was in the centre of His Garden. Other parts of the Bible also mention The Tree of Life. In Ezekiel 47:12 (NASB) we read of trees whose ‘fruit will be for food and their leaves for healing’. This image is taken up also in Revelation 22:2. It is clear particularly in Proverbs where a number of things are referred to as ‘a tree of life’ (wisdom (3:15), the fruit of the righteous (11:30), desire fulfilled (13:12), and a soothing tongue (15:4)) that the Tree of Life in these references symbolises that which brings joy and healing to people. Now, use a little lateral thinking. What else in the Bible is real and material, yet at the same time symbolises the life which is in Christ and points us repeatedly to Him? Something in which Christians share, and which reminds them that Jesus’ death brings us life? It is the sacrament of the Lord’s Supper. IF ADAM PASSED THE TEST OF OBEDIENCE, IT WOULD BE THE MEANS OF GOD’S IMPARTING ETERNAL LIFE TO HIM. Just as Christians who profane the Lord’s Supper are subject to judgment, so Adam would have been further condemned if he had presumed to eat the fruit to which he was not now entitled. In doing so, he would have been trying to rob life from God, a grave blasphemy. The implication of Genesis 3:22 (NIV) ‘And the Lord God said, “The man has now become like one of us, knowing good and evil. He must not be allowed to reach out his hand and take also from the tree of life and eat, and live for ever,”’ is that he, and us with him,4 would have been plunged into a condition of absolute lostness. He would have lived eternally cut off from God without hope of escape from the terrible consequences of sin. This would have been God’s just punishment for such a presumptuous sin, not merely a ‘magical’ effect of the Tree of Life. ← Did Death Exist Before the Fall?